Originating in the early 70’s, the disco music style emerged from America’s Urban nightlife scene. This soon transformed into house parties and discotheques. 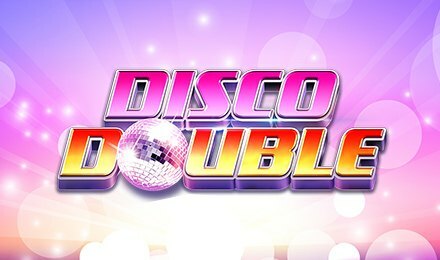 Disco Double slots by iSoftBet is a 5 reels and 20 paylines game which features a free spins round and a rewarding trail of symbols. The glamourous affair can take place on various devices like mobiles, desktops or tablets at Wicked Jackpots Casino! All you have to do is form winning combinations with symbols like: single bars, double bars, triple bars, green 7’s, blue 7’s, red 7’s, gold 7’s. purple stars and wilds. Before commencing your gameplay, set your bets with the various controls on the screen. Amount of Paylines Selection: All paylines are fixed. Coin Values: Set bets from £0.20 to the max amount of £20.00. The Wild is the symbol that substitutes for all symbols bar the scatter. Landing three, four or five of them will award 700, 5,000 or 10,000 coins respectively. Land three, four or five scatter symbols anywhere on the reels and receive 10 free spins to play. Also, receive 1x, 10x or 125x your total stake. Keep your eyes out for the mirror ball which doubles out all pay-outs if it lands on the middle reel. Let the disco vibes take over you at Wicked Jackpot Casino as you groove to the beats and pocket big wins!